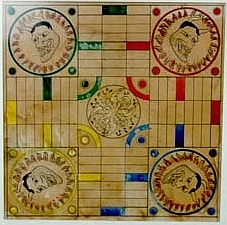 Parqués is a Colombian Pachisi-like game. It's very similar to to Ludo and Parcheesi. The goal of the game is the same as in Parcheesi: take all 4 pieces to the end before the opponents. The turn is passed by the right (anti-clockwise). In order to capture a piece, the player must put his/her pawn on the opponent's same square and the captured piece (pawn) goes back to its nest (or "jail"). There are safe places where the players can't "eat" (capture) any pawns. The player can eat pawns in a "home" square if he gets out of the nest and an opponent's pawn is on the square. If the player tosses pairs, for example a 6-6, 4-4 and so on, he gets an extra turn. If he tosses pairs three times in a row, he can advance a pawn to the end. Pairs are also useful to get out from the nest. With 6-6 or 1-1, the player can get all his four pawns out. With any other pair, the player can get only 2 pawns out. It is played with 2 dice, and it is a game for 2, 3 or 4 players. Unlike Parcheesi there are no blockades. A variable of this game is in case of having 3 consecutive pairs, the last moved piece must go to jail and the player loses the move. This is called "punishing success", a very Colombian thing.